When you are in South Africa (or elsewhere) and want to drink a South African Riesling, you are confronted with a number of wines that carry the word Riesling on the label with different surfixes: Cape Riesling, Paarl Riesling, South African Riesling, Weisser Riesling and Rhine Riesling. In deciding what wine to drink, you should know at least three things. First, the first 3 of these wines – Cape Riesling, Paarl Riesling and South African Riesling – are misnomers: these wines were not made with Riesling but made with the grape Crouchon Blanc. Crouchon Blanc is a grape from southern France, but seldomly grown there. It is thought to have been translocated to South Africa in the mid 19th century, and incorrectly named due to some identification error. Second, by contrast, Weisser Riesling and Rhine Riesling, as the Buitenverwachting Rhine Riesling above, are true Rieslings. Third, this all changed with the 2009 vintage. Today, the true Riesling is labeled as Riesling, without the pre-fixes Weisser or Rhine, and the formerly labeled Cape Riesling, Paarl Riesling and South African Riesling are labeled as Crouchen Blanc. Crouchen Blanc, sold as Riesling until now, as the 2008 Paarl Riesling, Cape of Good Hope, South Africa, below, will no longer be permitted to be labelled as Riesling. This posting is part of WeinRallye #43, a monthly blog event in Germany. Participating wine bloggers - mainly in Germany - are all releasing postings today under the heading "Riesling Spaetlese". Weinrallye is the brainchild of Thomas Lippert, a winemaker and wine blogger based in Heidelberg, Germany. The first wine rally took place in 2007. Thomas Lippert is the author of the wine blog Winzerblog. This month's wine rally is organized by Ralf Kaiser, one of Germany's leading wine bloggers. He will provide a summary of all postings on his wine blog Weinkaiser. The invitation to participate in the WeinRalley #43 is here. Paarl Riesling – the aristocratic Riesling grape crafted into the elegant De Villiers Cape Riesling Dry. Clean, light bodied, makes for a refreshing change. 12% Alc. However, it was not the "aristocratic Riesling grape" that I had in the glass, but a Crouchen Blanc (with 10% Chardonnay as I learned from the 2010 Platter's South African Wines Guide). In South Africa, the vineyard area planted with Riesling is about 220 hectares, which is about 0.2 % of South Africa’s total vineyard area. Although the share of Riesling in South Africa’s wine production is negligible, there is a lot of enthusiasm among those who plant Riesling. A number of younger vintners are in fact planting more Riesling. A local Riesling interest group – Just Riesling – was formed in 2007 by the majority of South African Riesling producers to further the interest of the variety. Last year, Just Riesling organized a competition in London, in which 16 South African Rieslings were judged. Designed as a 2010 snapshot of South African Riesling, styles ranged from a dry Thelema, at just under 3g/l remaining sugar to a sweet Klein Constantia at 240 g/l remaining sugar. 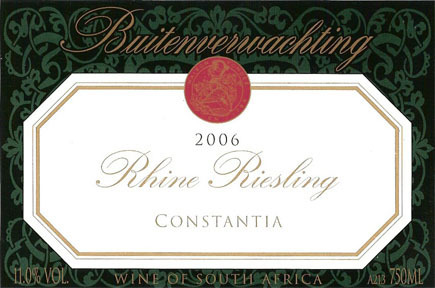 The dry category was won by the 2009 De Wetshof Riesling, while the sweet favorite, and the highest scoring wine of the tasting, was the Paul Cluver Riesling Noble Late Harvest 2009. According to Paul Cluver, Chairperson of Just Riesling, the competition was held in London to promote the commitment of South African producers to the Riesling variety on the international stage. "Holding the inaugural competition in 2010 is noteworthy, as this is the first year producers will be legally allowed to label this noble variety as (just) Riesling and not, as the law previously stated, prefixed by either Weisser or Rhine. Crouchen Blanc, sold as Riesling until now, will no longer be permitted to be labeled as such," says Cluver. "It was important to announce this to the larger wine world and to stress the passion South African producers have for Riesling and the way in which we interpret this variety through our own unique styles." "Riesling has a special place in our hearts," says Peter de Wet, who made the past two Riesling vintages at De Wetshof. "We love the delicacy of the wine, its aromatic vibrancy and the way in which it expresses the De Wetshof terroir”. We hope that the sterling work done by the association in promoting the grape variety will lead to more South Africans discovering the delicious wines made from the grape and greater recognition for our country's Rieslings on the world stage."